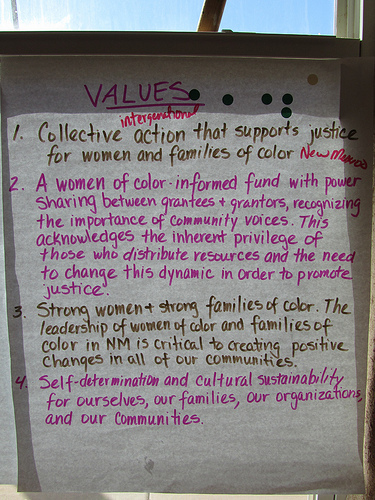 A couple of weeks ago, my coworker Amanda and I were in New Mexico to support Women Building Community, a collaboration of 12 women of color led organizations who are bringing together diverse communities, strategies and leaders to create a unique model of change that is by and for the communities of New Mexico. As we were driving 90 miles an hour through the desert to get from Albuquerque to Anthony, a small town just 30 minutes from the boarder with Mexico, Amanda and were talking about the familiar and the unfamiliar. Familiar: the experience of meeting amazing grassroots leaders who are innovating effective strategies for change. Unfamiliar: the miles and miles of open desert; border patrol agents scanning for signs of movement under the hot sun; the particular mix of indigenous, Chicana, Latina, immigrant and rural cultures; and, the amazing chili (I like both red and green). Being in an unfamiliar place provided us the opportunity to explore and remember some of the elements of deep and lasting change. Connecting the mind, body and spirit. Women Building Community started and ended each day with a moment, a ritual, or a breath that connected each person to herself, to each other, and to the moment of space and time that we were in. Putting our stories and families at the core of the change we seek. 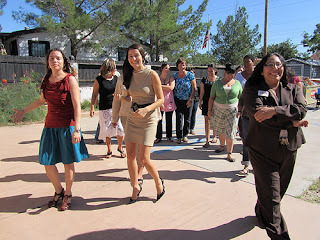 We attended a gathering to increase support for Women Building Community through individual donors. The importance of giving was made plain by the weaving together of the stories of the sisters, mothers, aunts and grandmothers sitting together in the backyard under the stars. It was obvious to all that supporting Women Building Community was just another way of keeping our families strong through generations. Building values-based relationships for the long term rather then seeking ideological purity. The organizations in Women Building Community represent a wide range of communities, strategies, and issues. 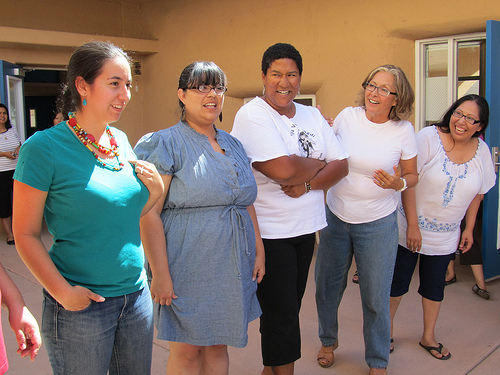 They work tirelessly to find their commonalities, have deep patience for their differences, and are well on their way building a shared agenda for change in New Mexico. Without overlooking the rural/urban divide, simplifying the differences between coastal states and interior states, or glossing over the challenges that this collaboration faces moving forward, I want to thank the Women Building Community for chance they gave Amanda and I to remember the familiar through the unfamiliar.